A few weeks ago, one of my followers asked me to make something for her. She said she was into eating healthy, but because of allergies etc., she had a lot of restrictions in her diet. She does not eat dairy, gluten, tomatoes, pork or red meat. So, with her in mind, I started planning todays dinner. 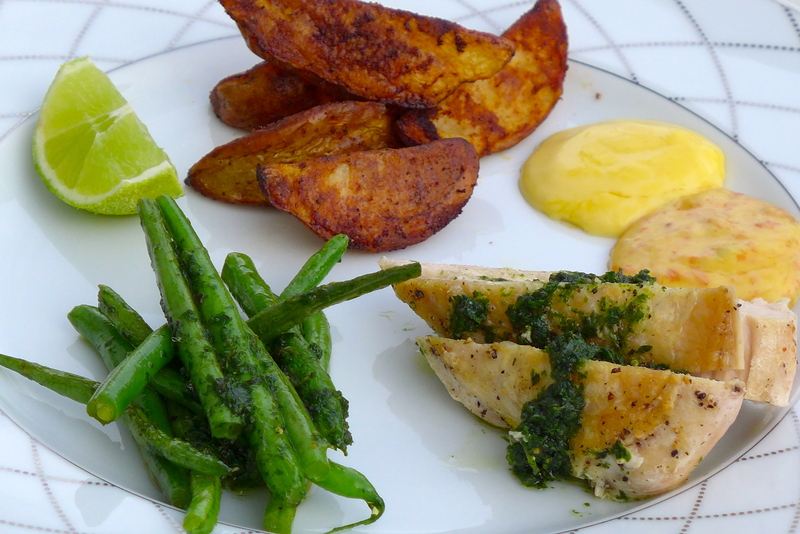 I ended up with this: Chicken breast with a lovely herby ‘sauce’, my potatoe wedges with aioli (this time I made two versions: one with added lime zest and the other with a lovely spice mix for patatas bravas, and fried green beans. If making potato wedges, put them in the oven now. The chicken breast I used were about 300 grams each. Let them reach room temperature. Season with salt and pepper each on side. Fry in olive oil in a frying-pan on low to medium heat for 15 minutes, then turn and fry for 10 minutes on the other side. In the meantime, make the ‘sauce’: mix the coriander, oregano, lime zest, chili, olive oil, salt and pepper with a hand-held blender. Put the sauce in a small plate that fits the chicken breast. When the chicken breast is done, put them in a single layer on top of the sauce and leave to rest for ten minutes. 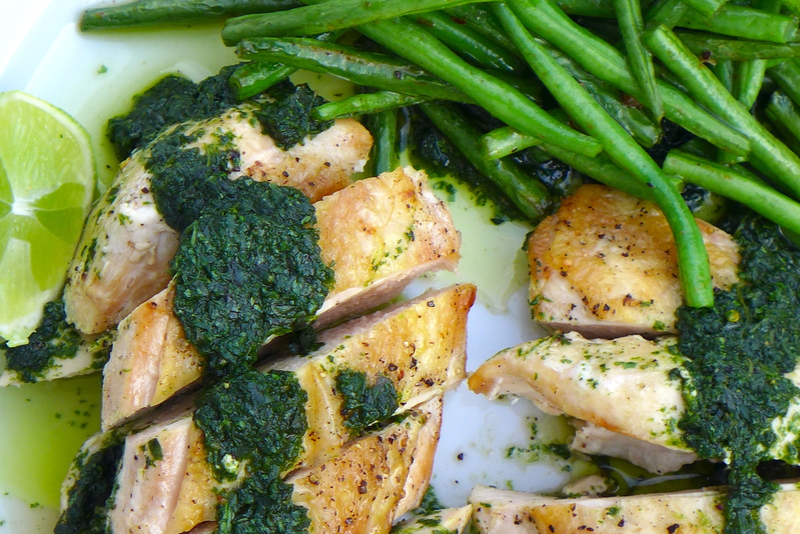 The chicken will be even tastier when left to rest on marinade, sauce or even just chopped herbs and garlic. 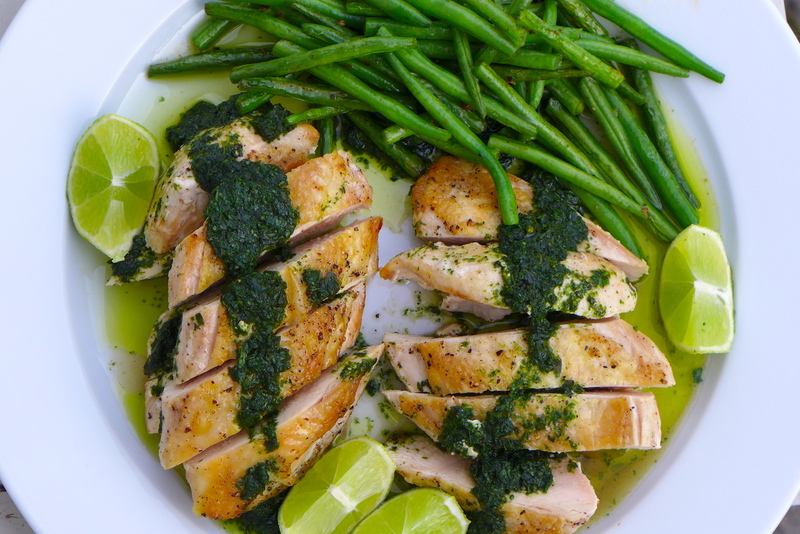 Just before serving, fry the green beans in the frying pan with all the lovely juices from the chicken. Cut the chicken in pieces and pour the juices and marinade over. Serve with potato wedges, aioli and the lime for squeezing over the chicken.